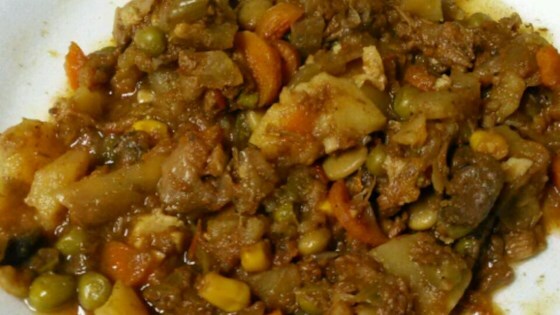 "This is a combination of three recipes- traditional American, Irish and Italian stews. Cooked very slowly, the beef will be very tender and the flavor unique. Served with yeast rolls or other bread, it makes a full meal." I made this for the fall hunting party of 15. They raved about it! The best stew I've made yet. I used water to cover the veggies and added cornstarch at the end. Next time I'm definitely going to substitute barley for the potatoes. We really enjoyed this one. We did decrease the rosemary a lot--by 75%. Added in red wine and other stuff to try and save the meal, but still didn't enjoy it.